I am working on creating a portal for a project on Sharepoint online. I have a contact list web part and I want to display the list of people working on/related to the project in the form of their business cards as displayed on Skype for Business. This Business card will include the picture, name and job title of the individual. I looked online for some resources to help me with this but the procedure they suggested did not work for me either because they were demonstrating it for the older version of Sharepoint(2010) or it might be because I am missing out on something. I would be grateful if anyone could help me with this or point me in the direction of the right procedure/resource to follow. I don't think you can achieve this OOTB you will have to write custom code. You can use the Office UI PersonaCard. You can follow the steps and copy the html and scripts required. Get data from your contact list which can be obtained through a REST API endpoint. Here is the sample code. 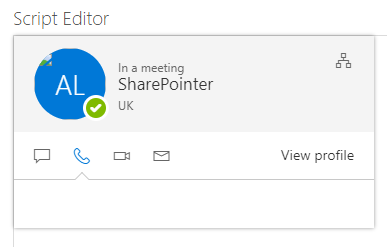 How to display Current Sharepoint site name in a script editor web part using JS?